50ct pack. Non-Glare Standard size sleeves are top quality, anti-reflective for professional play. 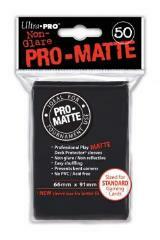 The first matte PRO sleeves! Acid free, No PVC.